It helps explain your spouse’s irritating, oddball, or bad behavior and how you might be encouraging it. Good counseling reveals flaws in your cognitions - those thoughts or perceptions you’ve formed and now apply to make sense of the present. For example, your spouse sometimes walks away during arguments and you interpret that as uncaring. In a later, unrelated event, she says something and walks away. In her mind she has simply passed along a piece of information and gone about her business. You, because of the numerous arguments, think this is just another example of your uncaring spouse. You have misunderstood the current situation. Good counseling would identify the cognition that you have an uncaring spouse so that you can decide whether or not it is true. Have you verified with her the reason why she walks away during arguments? And does it make sense to generalize the cognition to this or any other situation? It’s not enough to know how relationships work in general, but to how you and your spouse can relate, given your different personalities and beliefs. Good counseling shows how incompatibilities can be turned into a pleasant thing. Good couples therapy helps to get your perspective across to your spouse when you can’t, and helps you see your spouse’s perspective. This isn’t just about learning “communication skills.” This is also about realizing how another can hold a point of view that conflicts with yours. It’s not that either of you have to change your thinking, but just accept that the other can have a different, but still valid, perspective. It helps you achieve the goals you want but don’t know how to achieve. Sometimes you think you know what you need when you really need something else. Good counseling can point out what’s really happening. Note: the key phrase in all of this is “good counseling” or "good therapy." This marriage counseling section of Marriage Guardian is all about recognizing and getting good marital counseling. I’ve seen it written many times on internet forums that marriage counseling only works when both husband and wife want to make their marriage work. Sounds logical, right? Those folks are overlooking an important, yet simple, fact. You can change your marital relationship (or any relationship) just by what you do and how you behave. It may take longer than if the other person was completely on board with making improvements. He/she might be suspicious, wondering what you’re up to, and may even actively resist your changes. Over time, though, your sincerity and non-judgmental approach to having a better relationship will affect your spouse in a positive way. So if you are the only one who wants a marriage counselor’s help, go for it. The counselor can help you persuade your spouse to eventually join in. People resist couples therapy for many reasons. Having to talk about how your marriage isn’t working well to a stranger can arouse feelings of deep personal embarrassment. It can also put more distance between you and your spouse, and perhaps even permanently damage your relationship, if you force him/her into therapy. If commitment is the problem, a counselor dedicated to marriage can help bolster fading commitment by properly managing a conversation you or your spouse may not be able to produce on your own. That conversation may take time. It took a while for your love to grow and for you to become committed to one another. And it took time for it to fade. It may take a while to rebuild. Then again, commitment may not even be the real issue; it may only feel like it is. Counseling can help reveal that situation. 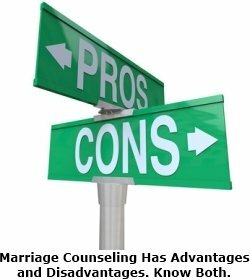 To improve your chances of success, be aware of the many reasons for not doing marriage counseling.